A boy’s second day in crèche took a happy turn when the head of the Happy Hookers presented him with a brand new hand-crocheted blanket. 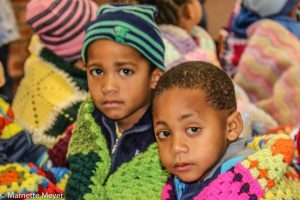 There were blankets for 46 children attending the Sunshine Daycare in Atlantis. The children, who range in age from 16 months to five years, cuddled up inside their blankets on the floor of the crèche, which used to be a church hall. Being so young they did not realise how special these blankets are. The blankets are made with more care than just about any item one will find in a high-end store. 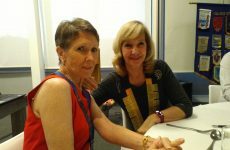 According to the head of the Happy Hookers, Di Joseph, the organisation of crochet artists has only ten members. 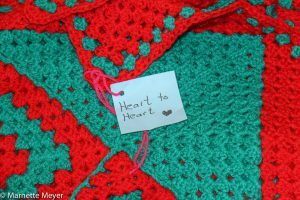 Somehow each woman crochets 16-30 blankets a year. Val, who works in IT and lectures, manages to crochet 16 a year in her spare time. Each blanket is a work of art, as the photos show. The patterns can be intricate, and the choice of colours lyrical. To top it all each blanket has a name. A confection in pink which is now the proud possession of Tiara Ryek (5) is called Namakaland Flowers while another brightly hued blanket bears the name Psycho Psychedelic. Geddit? Humour and good vibes abound in the hearts of this club, and it extended to the children wrapped up in their blankets. ‘Thank you, Aunties!” the children chorused as the women took their leave. 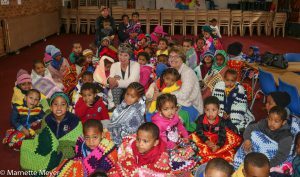 The head of Melkbosstrand Community Centre, Karen Dreyer, facilitated the gifting session. She learnt about the existence of the crèche from her char. 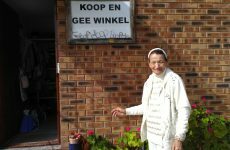 The crèche, an NPO, receives no funding apart from the fees for the children. These have to pay six staff members and provide the children with daily meals, art and learning material. According to Karen Sunshine Daycare needs paper, craft material, puzzles, educational toys and large beads. Donations can be made via Karen. People wishing to assist the Sunshine Daycare can call Karen Dreyer on 082 4155 442.